When constructing a horse stall, there are a variety of factors to consider before starting, any one of which can impact the accessibility of your barn, your horses’ health, horse and human safety, and much more. Here are just a few of the things you should consider before getting started. It’s imperative that your horses have enough space in their stalls to stand, lie down, and walk around in a circle. Standard horse stalls are 12 feet by 12 feet for horses that are 1,000 pounds. This standard shouldn’t be applied to all horses though. If your horse is larger, consider a larger stall. In order to determine what your aisle width will be, you have to think about how you’ll be using it. Do you have large equipment that needs to go down the center aisle? Do you plan on driving your truck in to deliver grain? If so, adjust the width to accommodate for equipment and vehicles. Many barn owners suggest an aisle width of at least 12 feet or more to accommodate vehicles, equipment, and horses. There are many options for horse stall construction materials. Concrete block offers maintenance free durability. Steel bars and/or mesh offer excellent ventilation. Wood tongue and groove provides a timeless, warm and inviting atmosphere. These materials can also be combined to utilize the best aspects of each. There are endless styles of horse stalls. One commonly referenced style is the European stall front that traditionally features a swinging door in the center of the stall that is lower than the rest of the front allowing the horse to put his head out into the aisle. Any style of stall can be customized with yoke openings, feed openings, blankets bars, etc. Stalls are one of the easiest part of your project to make unique to you. When it comes to stall doors, there are two main types: sliding doors and swinging doors. Sliding doors save space and allow you to easily enter the stall without your horse getting out. Swinging doors can be shorter, as they don’t require a track at the top. This allows for a more open ventilated space. Dutch doors are perfect for the exterior of a stall. The top half of the door can be opened independently of the bottom half allowing for ventilation. We recommend that you choose doors that are at least 4 feet by 8 feet for safety and ease of use. Here are some stall door features to consider, as well. The dividers between stalls can be solid or vented. This depends mostly on the temperament of your horses. Choosing dividers with at least a portion made of bars or mesh allows for ventilation and socialization amongst your equine friends. However, some horses are a bit anti-social and behave best when they have their own space. It is also possible to attach rubber padding to the side of your stalls to protect from cuts and abrasions. The most common solution for stall flooring is rubber mats. For a more forgiving surface, consider rubber crumb filled mattresses. To ensure that the mats or mattresses don’t become uneven over time, you may want to install a stabilizing grid system or porous asphalt underneath. Some owners prefer to have some of the feeding and/or watering process automated. There are many products available that accomplish this. We have used the Nelson brand of automatic waterers and attest to their quality. Positioning your horse’s food and water close to the floor gives your horse a more natural environment. There are a variety of products such as hay nets that are specifically designed to accomplish this. Having a wash stall in your barn makes grooming your horses a breeze. Your wash stall should be at least 10 feet by 12 feet. Non-slip flooring that drains well is essential including a hair trap in the drain. Good lighting and easily-accessible storage are also important. Horse stall construction comes with a host of considerations. If you need help deciding what to include in your next project, reach out to us today. 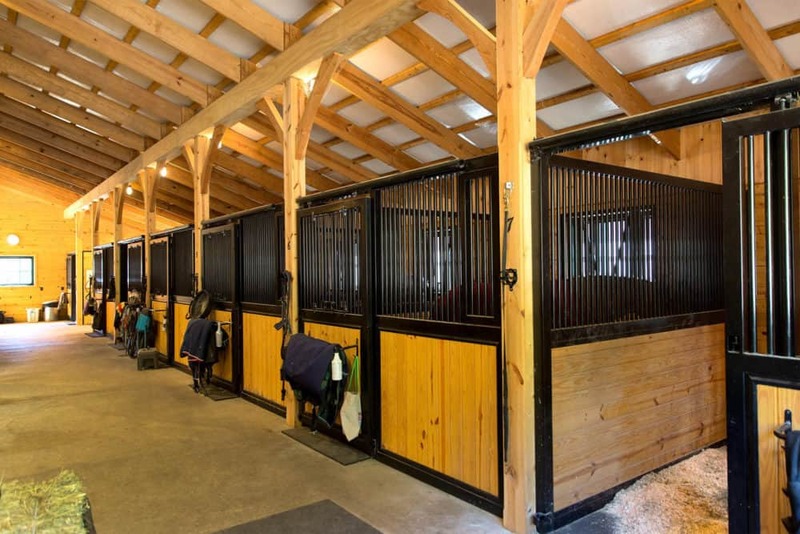 We would love to help you create a barn that perfectly fits your needs!